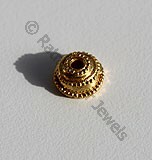 Gold bead caps, the substantial capabilities for your gold jewelry are usually a bowl shaped jewelry items. 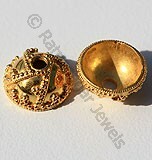 It wouldn’t be wrong to say that gold bead caps are an important part of your daily or party wear jewelry. 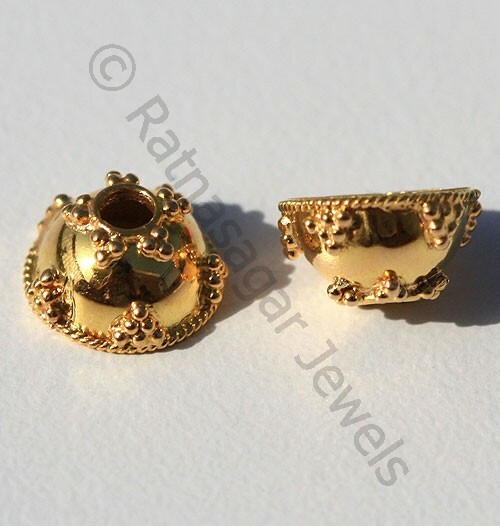 Ratna Sagar Jewels has a huge collection of these gold caps with the much desired elegance and shine. Designed by expert, trained and experienced Bengali artisans the bead caps are fit to be used in necklaces, bracelets, chains and other gold jewelry items. 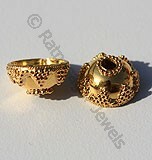 Made from 18K or 22K gold, these beads have won the heart of several people who have a flair for a variety of gemstones. Each of the beads available at Ratna Sagar Jewels strictly adhere the guidelines for making best bead caps and are durable in nature. All the latest trends are adopted and the choice and demand of the buyers is considered before the artisans begin designing some of the best beads ever made. 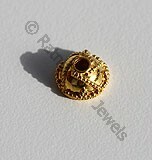 Buy a whole new range of attention grabbing gold bead caps from the online store of Ratna Sagar Jewels. Handmade solid genuine 18k Gold Beads and findings for designer gemstone jewelry making are available in 75.6 percent of purity and yellow in color, Designer Bead Cap. Handmade solid genuine 18k Gold Beads and findings for designer gemstone jewelry making are available in 75.6 percent of purity and yellow in color, Small Granulation Bead Cap. Handmade solid genuine 18k Gold Beads and findings for designer gemstone jewelry making are available in 75.6 percent of purity and yellow in color, Granulation Bead Cap. Handmade solid genuine 18k Gold Beads and findings for designer gemstone jewelry making are available in 75.6 percent of purity and yellow in color, Simple Bead Cap. Handmade solid genuine 18k Gold Beads and findings for designer gemstone jewelry making are available in 75.6 percent of purity and yellow in color, Heavy Granulation Bead Cap.